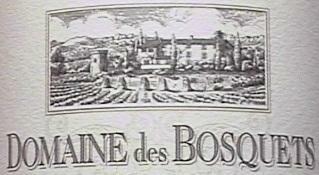 Domaine des Bosquets is a 26-hectare property that has a long history in Gigondas, first mentioned as a lieu-dit associated with viticulture in a document from 1376. Its association with the vine continued into the 17th century when the Seigneur de Laval, a local provencale aristocrat, established a farm and vineyards on the site of the current property. Some of those buildings survive there to this day. In the 19th century the estate passed through the hands of Eugene Raspail, who was the first to note the diversity of soil of Gigonda. He recognized that there are three main soil types: more fertile dark clay, rocky limestone and clay, and then blue clay mixed with marl and small areas of sand. It wasn't until 1962 that it finally ended up as part of Gabriel Meffre's constellation of properties. When he died, he passed the estate to daughter Sylvette Bréchet, as well as her son, Julien, who oversees the farming and makes the wines today.